Yesterday I was passing the transport bureau of the Beijing city government when I noticed some documents that had slipped from a folder and were lying in the gutter. They included an address book/diary and some coloured pictorial representations printed on photographic paper. The images, however, were incomprehensible to me without an explanation, so I leafed through the diary, and eventually found an appointment in a nearby Starbucks. Above: could this be the artist's impression of the solution to our problem? I ascertained which customer was Official Qing by shouting his name out in the entrance. At first everyone looked at me, but then one man answered and I took my place uninvited at his table. Threatened with a nationwide leak, he soon explained the marvellous pictures and his ideas for the new millennium. The plan is based on scientific analysis of empirical evidence. "I realised that it was the traffic jams that were holding up drivers in Beijing," elaborated my unwilling coffee (companion), "but as I looked up, I realised that there were vast amounts of empty space in the sky above the roads." It was a year later that Official Qing realised that these two phenomenonons could be combined to the mutual benefit of all. "My plan is both childishly simple and maturely complicated - why not build many tall support structures that the traffic jams can be placed on, thus freeing up the streets below for our embattled drivers!" It took another six minutes for Mr Qing to convince the Beijing city government that his idea was the only way to solve the crisis. "The concept was so new that I had to really argue in there!" he explains, warming to the subject. 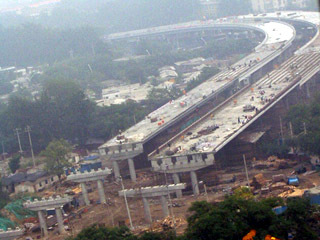 "Luckily, the Beijing council have many brothers-in-law who work in some big construction companies, so they soon realised just how advantageous this plan could be for Beijing's drivers." So there you have it. Thanks to the combined efforts of the Official Qing, the city government, and the city government's shifty in-laws, traffic jams in Beijing will soon be a thing of the past, freeing up the population to consider the meaning of life, take up new hobbies, and wile away their newfound leisure hours nibbling on moonbeams and frolicking in rainbows.